Thousands gather in Goldsboro N.C. for God Belongs in My City Prayer march in 2012. We are living in a season where the Lord wants to personally invade our lives and the cities and regions we occupy. To invade literally means to “enter forcefully and inflict serious injury.” This speaks to me that God is eager to enter into our lives and cities and inflict serious damage to the enemy. C-MON!!! A major expression of this invasion seems to be coming through the unified cry for mobilized prayer & worship gatherings that run for consecutive hours at a time. The Lord is also impressing on me that this invasion of our cities and regions will release an unprecedented display of His presence; resulting in city-wide transformation, unusual miracles, and a BOLDNESS & COURAGE to occupy entire cities with the gospel! That certain cities which have been previously known for violence, murder, gang-activity, addiction problems, etc. would, after the invasion of Jesus, become known as cities of refuge, great peace, booming economies, and open heavens like Bethel or Jerusalem in the Bible. We are already beginning to see fruit of this in Wilmington, N.C.
Last summer in Wilmington, nearly every pastor and clergy member was contacted by city police and summoned to the Police department to meet with the Chief of Police. Discouraged and overwhelmed by massive increase of shootings and gang violence, the police expressed to us ministers, that they were helpless and needed help from the churches of Wilmington. It was so bad that one weekend witnessed over 18 shootings, some resulting in deaths. This plea for help lead to a unifying effort to prayer walk the downtown streets of Wilmington. 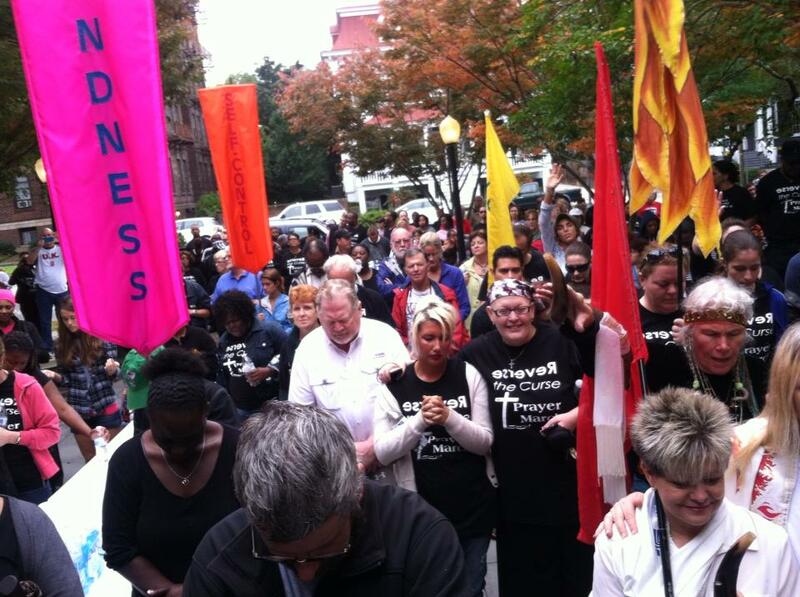 So on November 2, 2013, over 1,000 believers came together in downtown Wilmington to prayer march 1.8 miles of the city. Compelled by a heavenly synergy of different denominations, generations, and racial backgrounds all coming together, it was a breath-taking display of the church taking back their city. A people, who came together, and filled the streets with powerful cries of prayer & worship. WOW! Since that time, small prayer groups have been prayer walking Wilmington’s inner cities once a month picking-up trash and blessing the community. Moreover, projects where prayer walkers have been invading, are witnessing great surges of peace, revival, and finical help. What is going on? God is speaking to us. He wants to invade our cities, churches, communities, schools, campuses, and governments with unified attacks of prayer & worship and inflict as much damage on the enemy as possible. It is a time to ADVANCE!